Well now I'm confused. 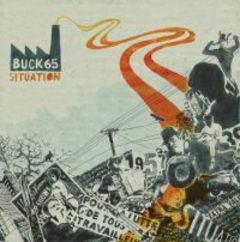 With 2003's seminal Talkin' Honky Blues Buck 65 kept one eye in the rear view mirror of hip hop and the other trained way ahead into a land only he knew about. This departure from his roots was reinforced on Secret House Against The World but for different reasons. On both albums he was infusing his rhyme style with heart wrenching folk fables and personal observations that rocketed him way beyond the grasp of hip hop. So now, with what I think is his 11th album, he seems to have come back home. This statement is neither completely true nor a terrible thing but more a curious shift from the course he seemed to be heading. Situation is a concept album of sorts and this just adds to my confusion. The record is based around the many defining events of 1957, a date that Buck claims was the start of underground and independent culture and that 50 years on we are on the cusp of a similar renaissance. This in itself is an interesting concept but with his last 2 albums Buck seemed to be an artist that was leading the way in this renaissance but with this return to hip hop appears to be a safe step backwards. I know that the whole album is a glance back over the last 50 years but in following that concept so closely Situation can, at times sound like my dad complaining that things weren't like that in his day. But I wouldn't want to labour the negative too much as this is still a great listen. The return to hip hop means Buck's trademark one-man-band scratches and cuts are faster than ever and the beats heavy and rapid. The homemade sound has been buffed up and the production is tight. Thematically, Situation sheds the autobiographical approach in favour of a more fictional storytelling. In many of the songs Buck vividly creates a myriad of strange characters that, in all their many guises, inhabit the dark and seedy world of 1957. Shutter Buggin' sees him as a sleazy and reluctant pornographer who's just in it for the cash while his vice-squad cop in Spread 'Em deals with the same low-life but from the other side. Songs like Ho-Boys and The Beatific hark back to the Buck of recent past with their delicate piano melody and understated beats. His rhymes are masked in the regular abstract imagery here and fit better with his gruff delivery. This can be said for many of the songs throughout the second half of this record. It seems to settle into itself and not feel the need to hammer home the concept. These songs have more longevity due to their reluctance to give it all up at once. With Mr Nobody and the beautiful The Outskirts the tempo is brought right down and this is when I think Buck is at his strongest. His style suits a shuffling pace and coupled with the delicate guitar and saxophone he manages to create real melancholia and with it his 1957 concept seems all the more believable. Buck 65 is undoubtedly one of the more interesting MC's around at the moment. His back catalogue shows clearly his ability to dazzle and surprise. He is capable of intricately weaving rhymes about an abusive father or the size of his manhood all in the same album but this is the first time such a defined structure has been imposed on his work. I am not sure it really works to the extent that it's meant to as the constant references to the past can sound tired and the whole back-in-the-day hip hop thing has a very short lifespan. But, as soon as the lines are blurred around this concept the record starts to come into its own. Situation is a collection of great songs and while it may not work as a whole it is as expertly crafted as you'd expect from an artist who has always been about a hip hop renaissance.